Current Dublin Captain and 20×20 ambassador Laura Twomey has suggested that the introduction of “more physicality” in camogie would “let the game flow” while also increasing audience and player participation. 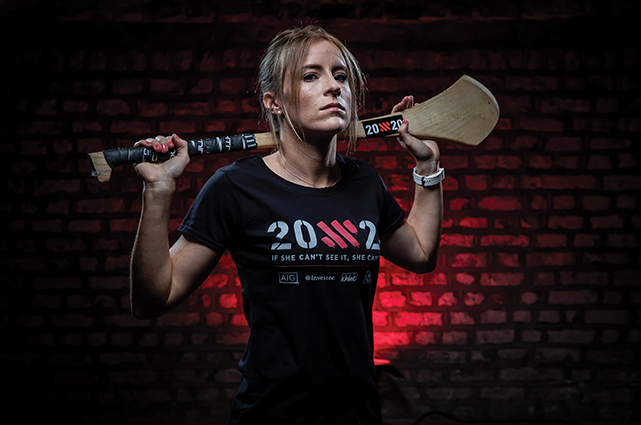 “We’re visible to younger females and athletes around Ireland. They have a role model to look up to,” said Twomey. After obtaining a job in Raheny following her PHD in DCU, Twomey is keen to follow her ambassadorial role through in her workplace. “I’m teaching in an all-girls school in Manor House in Raheny. An area that I’m trying to bring it through in the education system is to expose the girls from first year through to sixth year to as much sport, be it in PE or outside school, as I can,” she said. One of her big focuses in secondary education is to try and discourage drop outs and keep girls involved in sport. In terms of her platform with the Dublin Ladies team, Twomey furthers her message to girls throughout the true-blue schools and communities. “We do a number of different initiatives like camps for both younger girls and older girls at various times of the year to try and increase participation numbers, specifically of camogie,” said Twomey. “Obviously just even using social media, using your voice to try and raise awareness of the actual (20×20) campaign,” she added. Twomey lamented the lower viewership of camogie compared to Gaelic football, putting it down to structural and promotional failings. Twomey has echoed fellow Dub Eve O’Brien’s views that rule such as the tackle, the hand pass goal and the compulsion of skirts need to be changed. “There’s not a uniform way of refereeing games, so I think if different rules that myself and Eve (O’Brien) have been speaking out about for the last while were implemented, or were brought out of the game it might encourage more people to get involved it also might encourage more players to stay involved in the game,” said Twomey. “I don’t know about bringing in or allowing a shoulder. It’s up for debate. Obviously, defenders and that might be more on the side of bringing it in, but I suppose at the moment we’re just so restricted in what we can and can’t do. Any sort of physicality and there’s a free pulled up against you,” she added. “If refs are all on the same page, and that has to come from the camogie association where there’s a rule change regarding physicality. The condition and strength and speed of players these days is just improving and the access to resources help that,” said Twomey. “You could potentially introduce shouldering, but you could also word it in another way. Not necessarily a shoulder but allow more physicality into the game and I think that in turn would let the game flow,” she said. “The all-Ireland finals were very stop starty. For supporters watching it, it can be very frustrating,” she added.